What can i say about this Tearoom in the most beautiful part of the world - The most Northerly tip of Orkney mainland . It has the most stunning views overlooking the Brough of Birsay and towards Marwick Head. When you couple that with great food and even better Homemade cakes and goodies - i am in serious heaven. Seriously though , this is just the most beautiful location for relaxing and eating cake . Georgie is the owner and shares the baking with 2 fellow bakers to create some great bakes including recipes that are unique to them . I tried an amazing Bourboun , Beremeal biscuit which is made with the islands own Beremeal flour and gives it a unique texture . Georgie made this biscuit recipe herself and she lovingly calls it the 3b's. I dont normally eat a whole biscuit/cake when testing but this one was devoured in seconds. There was some modern cakes using real rose flowers and vanilla to create a mouthwatering cake . The vegan drizzle cake was quite exceptional considering there was not much that you would normally make a cake with in it !! I absolutely love Birsay Bay and cant wait to return for more 3b's. Slainte ! I absolutely adore this Island North of Scotland called Orkney !. Very self sufficient and even has its own Mill with its very own Flour - Beremeal . You cant get this flour on the mainland and the bread the Orcadians make with this flour is Unique. Not unlike a Wheaten bread , anyhow i digress . We were on our way to the Islands Capital - Kirkwall and Cafe Lolz in the High Street . Lorraine is the most infectious , chatty and totally welcoming lady you could meet , born to customer service i would say and boy can she bake ! I was looking forward to this Assessment as this was a re-visit and i knew the standard , but you always wonder if premises can maintain a certain standard and i was left in no doubt once the cakes started to pour over my table . Brownies, Apricot and raisin Muffins, Death By Chocolate but my absolute favourite ( As last visit) was the Toffee and Walnut slice . I have absolutely no idea what the recipe is ( sadly) but this is just heaven . Chewy but not too chewy and Walnuts but not in your face walnuts . Love it. This lady does all the Baking for quite a large shop and all the cakes were as good as the next. The staff are utterly lovely and it just felt like a home from home. 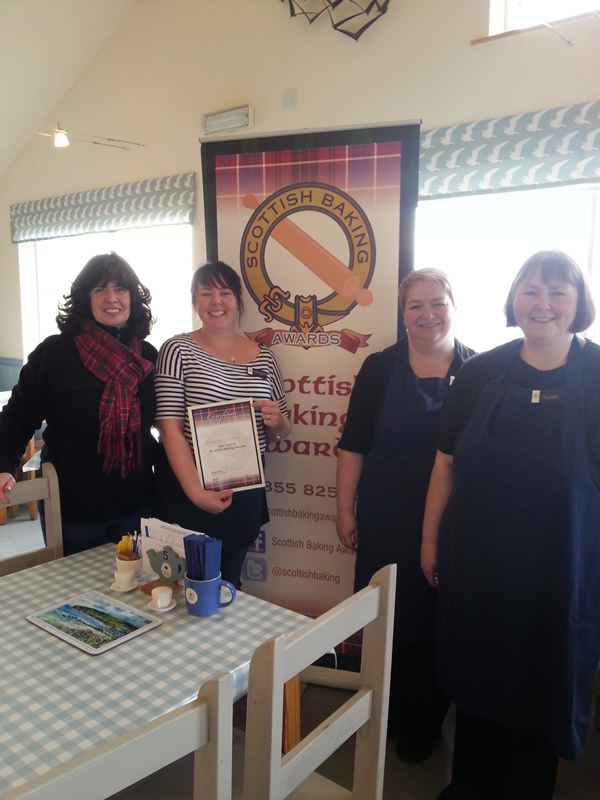 You absolutely cant walk past this Cafe if ever in Orkney - Its a must for Cake lovers. See you again very soon Lolz !! THIS WEEKEND I TOOK THE FAMILY NORTH WITH ME TO ASSESS IN THE BEAUTIFUL WICK,THURSO AND JOHN O GROATS .ON THE SUNDAY WE DECIDED TO HAVE THE DAY OFF AND TAKE A TRIP TO THE BEAUTIFUL ORKNEY ISLAND . A STUNNING ISLAND AND A SMOOTH CROSSING GAVE US AN APPETITE WHICH WAS WELL AND TRULY HUGE BY THE TIME WE GOT TO KIRKWALL. IN THE BUSY LITTLE TOWN WE CAME ACROSS CAFE LOLZ@21 . YOU WOULD HAVE THOUGHT WE HADNT SEEN FOOD IN WEEKS WITH THE AMMOUNT OF CAKE WE ORDERED -£40 WORTH TO BE EXACT. THIS CAFE HAD AMAZING CAKES AND THE BEST GINGERBREAD I HAVE EVER TASTED .THE TOFFEE AND WALNUT SLICE WAS SIMPLY DEVINE AND WE HAD TO HAVE ANOTHER.THE SCONE HOWEVER WAS SERVED WITH A HOMEMADE RHUBARB AND SPICE JAM AND CLOTTED CREAM - OH LORD HEAVEN HONESTLY!! THE LEMON MERINGUE SLICE WAS BIGGER THAN THE PLATE IT WAS SERVED ON AND THE HUGE BLUEBERRY MUFFIN WAS VERY MOIST . EVERY SINGLE CAKE WAS EXCELLENT AND THE YOUNG STAFF VERY FRIENDLY AND ATTENTIVE. WHEN YOU SEE YOUNG STAFF LIKE THIS BEING AS WELCOMING AND FRIENDLY THIS IS A HUGE PLUS NOWADAYS AND FOR ME CAN MAKE THE EXPERIENCE AN EVEN MORE PLEASURABLE ONE . I HOPE TO COME BACK ONE DAY AND EAT JUST AS MANY OF THESE BEAUTIFUL CAKES AND BE WELCOMED BY LOVELY ORCADIAN STAFF.WELL DONE LORRAINE AND HER TEAM. Nominated today online by a local lass. This tearoom re-opens 30th March 2013 and an assessor will be able to visit then. Today was a glorious boat journey to the magical island of Orkney . Our assessor reports the most beautiful views are to be had on the drive from the boat at the south of the Island to the North where nestled in a stunning bay lies the Birsay Bay Tearoom. This Tearoom is just about to receive new owners and we met the outgoing who hopefully pass on the great Cake recipes. The Dark Chocolate and Orange Cake i am told is worth going back to the island alone for !! When you get a stunning view on a magical island on a perfect Scottish day with glorious sunshine and great cake - what more in life could you wish for ?? 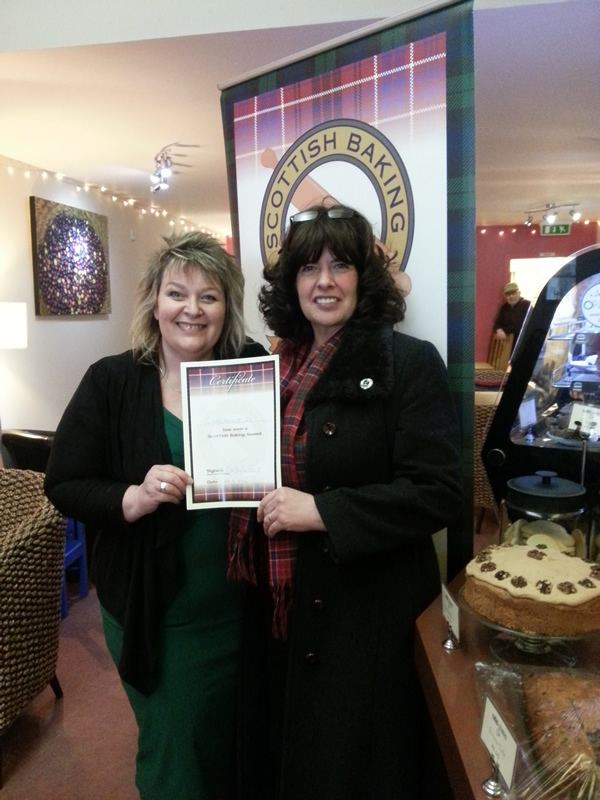 Your Award is on its way Birsay bay and well done - Note to new owners -Keep the Baker !! !